The PowerPoint of Horizontal Arrows 4 Steps Diagram design with graphics is a flexible and versatile visual aid. Ideal for business and educational presentations and an excellent choice to demonstrate instructions and guidelines. This PowerPoint contain the concepts related to planning, financial analysis and management. 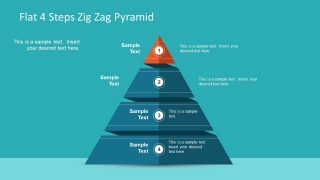 The professional managers, teachers and student, all can benefit from this template design to present four step concepts. However, it is also useful in staff meetings and first day orientations for providing code of conduct and policies. For example, add step by step instruction of semester’s evaluation. Similarly, display a concept of programming like problem analysis, algorithm, flowchart and program instructions. 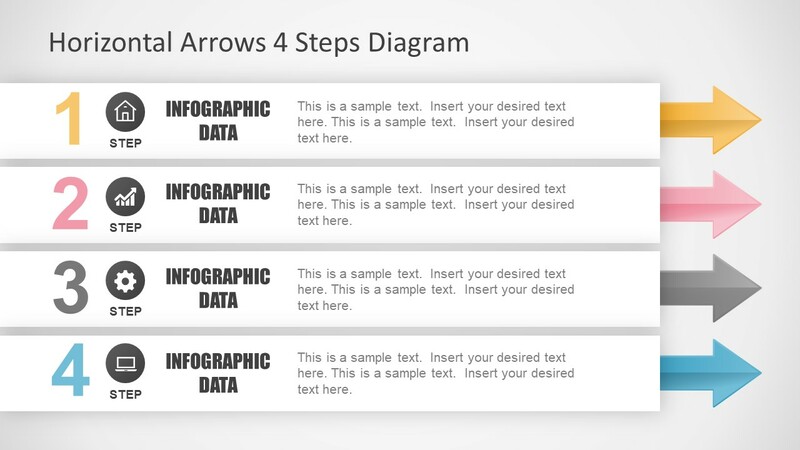 The Horizontal Arrows 4 Steps Diagram is a simple slide of flat design vector icons, shapes and chevron style images. The PowerPoint arrows shape pointing to the right gives the idea of detail description ahead. Therefore, users can copy this slide by highlighting one stage at a time to further describe a topic. Moreover, copy the side into another presentation containing further slides to explain the factors. The PowerPoint is 100% editable assisting users to customize template according to their needs. The size and moving objects takes only few seconds and mouse clicks. Although, customizing colors means changing all the elements of PowerPoint including shapes, icons, font, background etc. But, there is also an option to quickly modify the entire theme of template using custom colors in designs menu. To customize theme, select a slide and go to the variants dropdown menu in designs, here, get a pallet. 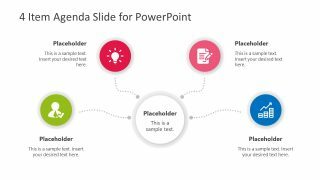 Alternatively to this presentation template, other PowerPoint templates can be used with original diagrams and background designs. Elaborate key points of the subject in 4 steps of horizontal arrows diagram and outline achievable targets. Insert appropriate content in the text placeholders and customize each section. Impress the audience, convey ideas and concepts with productive purpose. 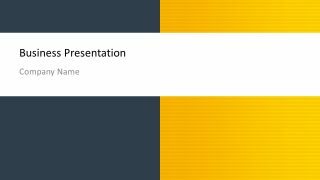 This PowerPoint template is a generic design, applicable regardless of industry or market place.